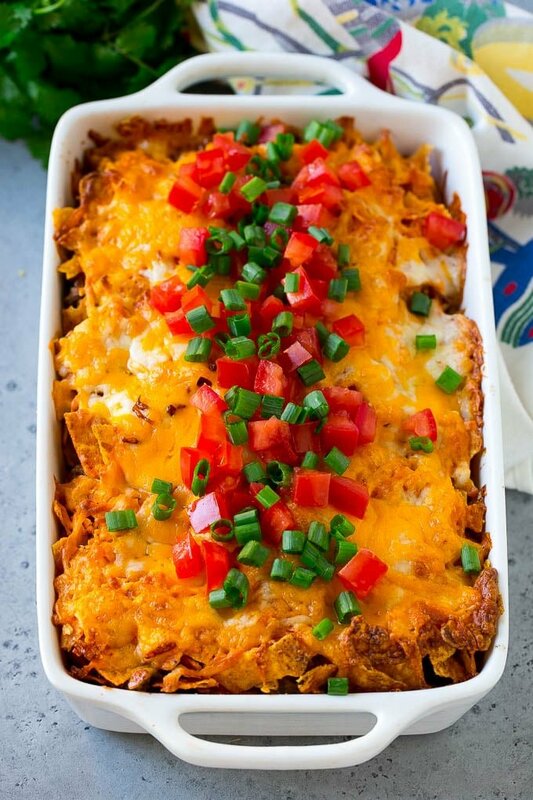 This Dorito casserole is layers of crushed Dorito tortilla chips, ground beef, salsa and cheese, all baked together to golden brown perfection. An easy dinner option that the whole family will love! 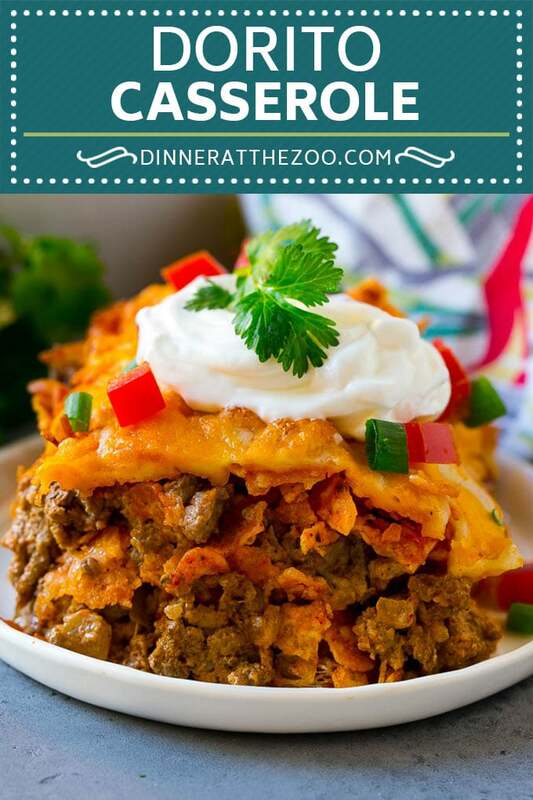 I’m all about the hearty casseroles, my family’s favorites include beef noodle casserole, chicken and rice casserole, and this Mexican style Dorito casserole. This unique dish is quick to assemble and tastes just like tacos! There’s nothing better than a hot, cheesy casserole on a cold day. This Dorito casserole is always a huge hit in my house, my kids always get so excited when it’s on the menu. I don’t blame them, chips for dinner is always a good thing! How do you make Dorito casserole? This recipe starts with ground beef, which is cooked with onions, taco seasoning and salsa to form the base of the casserole. 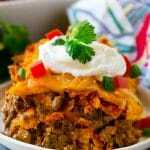 The ground beef mixture gets mixed with sour cream, and then is layered in a casserole dish with crushed Dorito chips and cheese. The casserole goes into the oven to bake, and then is finished off with diced tomatoes and green onions. You want to crush your chips into 1/2 inch pieces – if you make them too small, they’ll turn into mush in the casserole. 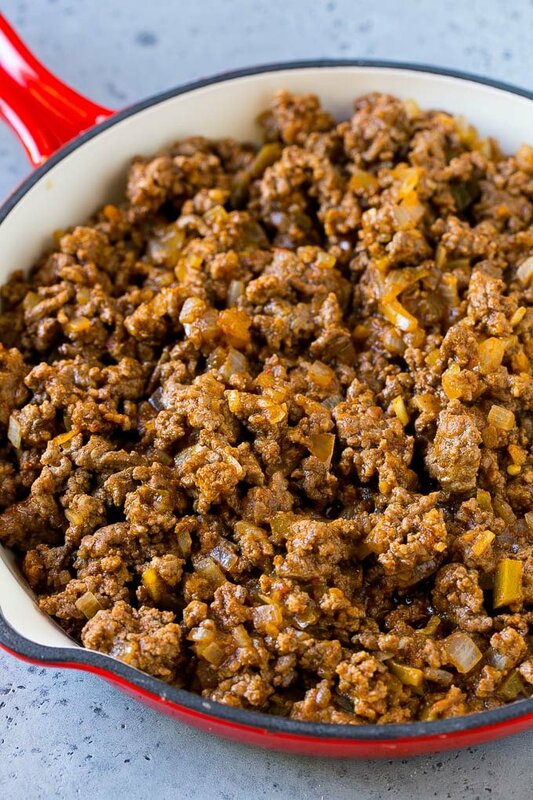 I use 90% lean ground beef – it has plenty of flavor but isn’t overly greasy. You can use any flavor Doritos you like, I typically make this dish with the nacho cheese flavored chips. 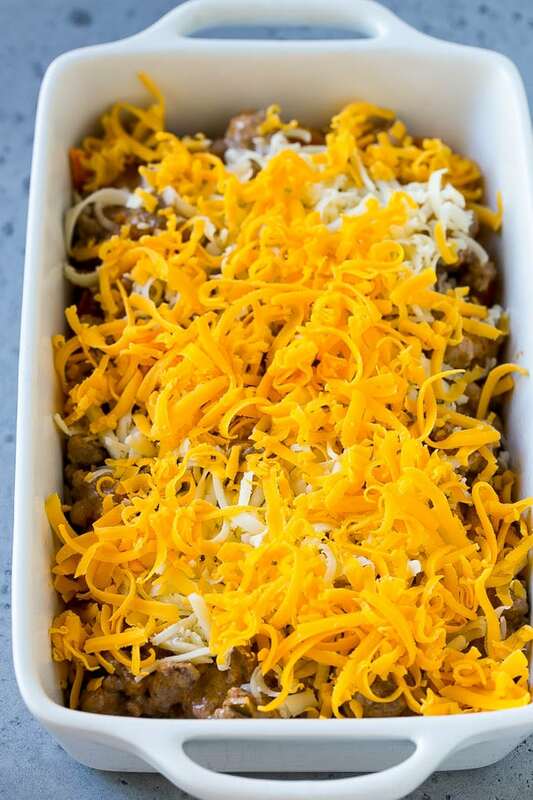 I use a blend of cheddar and jack cheese for this casserole – other great choices would be a Mexican style blend or pepper jack cheese. You can garnish your casserole with a variety of toppings. I typically serve my Dorito casserole with sour cream, diced tomatoes and green onions. Other great options are chopped cilantro, olives and avocado. Can you make Dorito casserole in advance? You can assemble this casserole up to 6 hours before you plan to bake it. Place yous covered casserole in the fridge until it’s time to put it in the oven. You may need to increase the baking time to compensate for starting with a cold casserole. There are so many ways to change up this Dorito casserole to suit your tastes, the possibilities are endless! Tortilla Chips: Substitute your favorite tortilla chips instead of flavored Doritos. Spicy: Use hot salsa and pepper jack cheese. Veggies: Add 1 finely diced bell pepper to the ground beef mixture. Protein: Use ground turkey or shredded chicken instead of the beef. I have to admit, I was skeptical the first time I made this one. 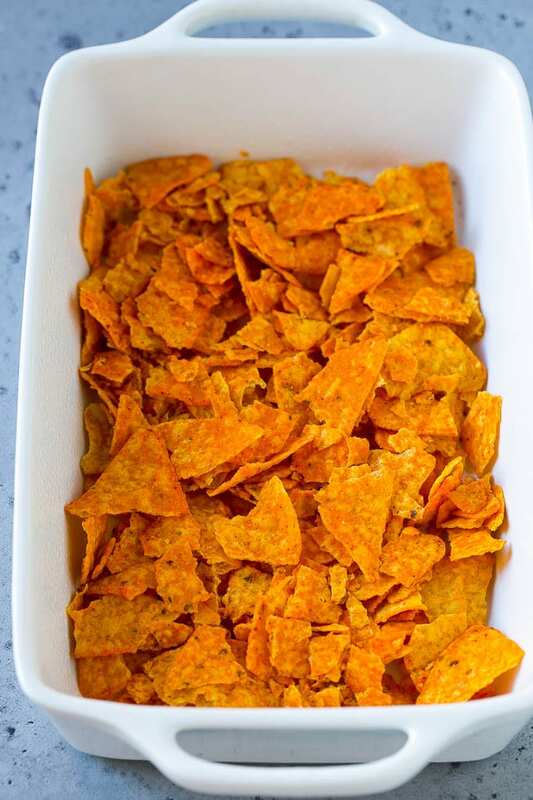 Dorito chips, in casserole form? Trust me though, it really works! It’s like eating a super delicious taco with fixings. I often bring this casserole to potlucks and it always disappears instantly! 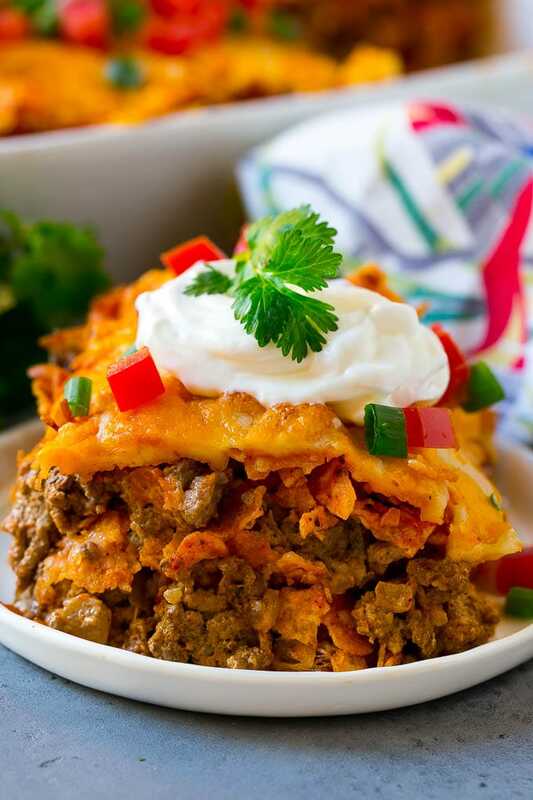 If you like Mexican food, you’ll enjoy Dorito casserole. Preheat the oven to 375 degrees F. Coat a 2-3 quart baking dish with cooking spray. Heat the olive oil in a large pan over medium high heat. Add the beef and cook for 4-5 minutes or until just browned, breaking up the meat with a spatula. Stir in the taco seasoning and red salsa. Simmer for 3-4 minutes. Remove the pan from the heat and stir in the sour cream. Lightly crush the Doritos. Spread 1/3 of the chips over the bottom of the prepared pan. Place 1/2 of the meat mixture on top of the chips, then add 1/3 of the cheese in an even layer. Repeat the process with another 1/3 of the chips, the rest of the meat, and 1/3 of the cheese. Add the remaining chips, then the final layer of cheese. Cover the baking dish with foil. Bake for 30 minutes. Uncover and bake for an additional 10-15 minutes or until cheese is melted and starting to brown. Sprinkle the tomatoes and green onions over the casserole, then serve. Top with additional taco flavorings such as sour cream, olives, etc. if desired. I recently made some Mexican food and everyone loved it. I need to try this recipe soon! It looks amazing!